Franco Di Santo’s expired contract means he leaves his somewhat ambiguous position at Wigan Athletic at the end of last season perhaps not at the top of Premier League shopping lists. However, he would suit Swansea City and the type of football Michael Laudrup has them playing. 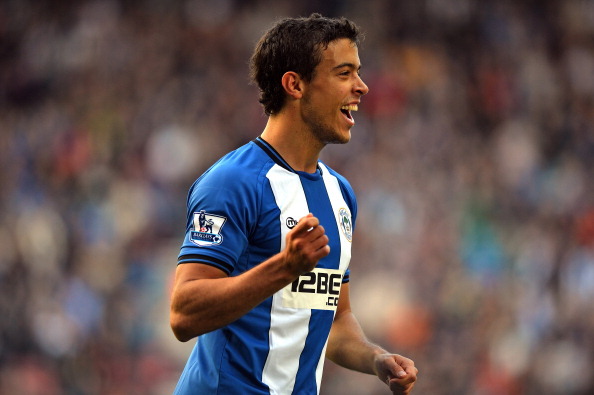 Di Santo is an out-and-out forward and with a bit of confidence, he can become a great option in the Premier League. With Swansea playing in this season’s Europa League, another forward in the squad would be a useful acquisition. Swansea are likely to play a lot of games next season and will need to sign a few players this summer to make sure they keep up with the demands of playing in Europe in just their third season in the Premier League. Michu was a brilliant signing for Swansea and he proved he can handle the Premier League. His 22 goals in all competitions helped Swansea to a respectable league position and League Cup glory. He will need some help though as with Danny Graham and Scott Sinclair leaving the Liberty Stadium, Michu was left with the tough task of leading the line on his own. If Di Santo was to sign for Swansea, he would fit right into the 4-2-3-1 system, as he could lead the line and hold the ball up for the attacking midfielders waiting in and around the box. Di Santo doesn’t have a great goal scoring record in the Premier League but he hasn’t had the confidence either. At Wigan Athletic, Roberto Martinez gave Di Santo his chances in the first team but he was sometimes out wide or as a target man. He is much better utilised as a ball-at-the-feet forward. Often in a 4-2-3-1 system, the man upfront is a target man but in that role Michu came deep to receive the ball. By keeping the ball at his feet to either create space for a shot or feed an attacker in a better position, Michu added fluency and a different dimension to the Swansea attack. Di Santo is exactly in that mould and would score more goals if used properly. When playing away in the Europa League, it’s not easy to take your first team on a Thursday night and then use the same team on the Sunday lunch time. This is why Swansea need a lot of bodies. The schedule pressure on the players will start to show in January and this is often when teams start to pick up more injuries. It could be a big problem for an already thin squad at Swansea. Di Santo deserves his chance in the Premier League again and aged just 24, he could have a 2 year deal to prove his worth. Swansea could go and spend a few million on a player but when a rough diamond is available on a free transfer, it is worth taking the chance.